Kodak manufactured Polaroid's instant film products from 1963 to 1969. Polaroid decided to manufacture its own. Since Kodak has a lot of experience manufacturing Polaroid's film the original plan was to create packfilm type instant products. There were many prototypes and test runs of the film with many private demonstrations to their board. Plans changed when Polaroid in 1972 released the integral type film with the introduction of the SX-70 system. Kodak decided to scrap the plans for packfilm release and focus on an integral type process. Kodak continued to use highly modified versions of Polaroid packfilm cameras as prototypes to test their integral products. On the other side of the pacific, Fujifilm also wanted an instant photo system. Though not identical, it was primary based on Kodak's instant film technology. For more see Fujifilm instant photography. Unlike Polaroids integral film packs, Kodak's did not contain a battery, along with conventional batteries, the use of a flat J sized 4LR61 batteries were also common in the cameras. This decision was made because it would cost less per pack and because Polaroid had a long history of technical problems with batteries in film packs which led to them manufacturing their own. 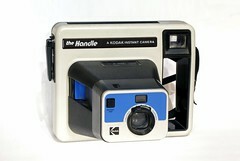 Upon introduction of Kodak instant products, Polaroid filed suit against Kodak in 1976 for patent infringement. The case dragged on for years. 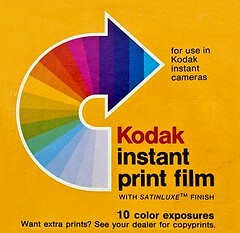 Kodak lost the dispute, after the ruling in 1985, Kodak announced the discontinuation of their instant photo products. 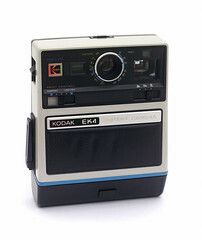 The original Kodak Instant line of cameras uses a ISO 150 instant film. They came in 10 photos per pack. The main version PR10 has a glossy surface, while a variation called "Satinluxe" has a silky matte type finish. Upon release of the 300 ISO Kodamatic Instant system the PR10 was replaced with the PR144, stating compatibility differences.